While visiting his scientist father in Belarus, a military gun designer stumbles into a deadly international plot. Oregon-based Peter Savage, head of EJ Enterprises, which designs and manufactures magnetic-impulse pistols, reads with interest reports of Russian militia activity in Latvia. Nearby in Sacramento, his close friend Jim Nicolaou, a former Navy SEAL, learns of a suspicious rash of childhood deaths in the same region. Savage visits his father, Ian, a chemistry professor spending a sabbatical year at Belarussian State University in Minsk doing research. Savage is welcomed by expansive local professor Dmitri Kaspar. The reunion is spoiled, however, by the arrival Russian soldiers armed with AK-74s who take the group prisoner. While Savage tries to put together a MacGyver-like escape, Nicolaou is monitoring the unrest in the region from his California vantage. Secret intelligence indicates that the Russians are amassing missiles, and that can’t be good. Savage and company successfully escape only to hear a series of explosions nearby. It’s a rescue team, sent by Nicoloau. 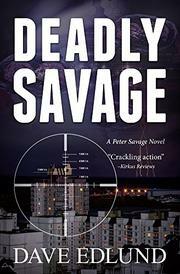 Civilian hostages remain; Savage takes a key role in the rescue. Meanwhile, in Washington, the president is being briefed on another threat, of chemical warfare in Europe via an insidious virus. And the virus, it seems, is set to be released by a machine right there in Belarus. Peter, with his colleagues, sets out to implement a plan to disable it. Crackling action, brisk pace, timely topic; Edlund’s third Savage thriller (Relentless Savage, 2015, etc.) has all the elements, if little subtlety.